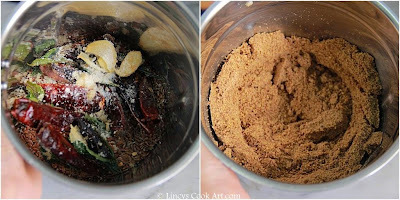 Flax Seed Podi: Flax seeds are called as one of the most powerful plant foods on the planet. There’s some evidence in it since it may help reduce your risk of heart disease, cancer, stroke and diabetes. And thereof I have planned to incorporate this healthy seed in my diet in a tasty way. Incorporating flax seeds in Indian diet is quite challenging. So I decided to make this simple yet tasty side side dish or dip for idlis & dosas. 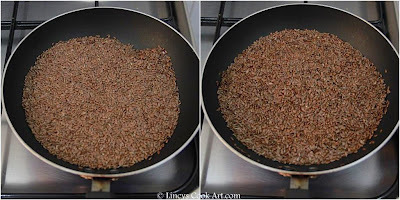 Most nutrition experts recommend ground over whole flaxseed because the ground form is easier for your body to digest. Whole flaxseed may pass through your intestine undigested, which means you won't get all the benefits. Information collected from here. Flaxseed's health benefits come from the fact that it's high in fiber and omega-3 fatty acids, as well as phytochemicals called lignans. One tablespoon of ground flaxseed contains 2 grams of polyunsaturated fatty acids (includes the omega 3s) and 2 grams of dietary fiber and 37 calories. Flaxseed is commonly used to improve digestive health or relieve constipation. Flaxseed may also help lower total blood cholesterol and low-density lipoprotein (LDL, or "bad") cholesterol levels, which may help reduce the risk of heart disease. 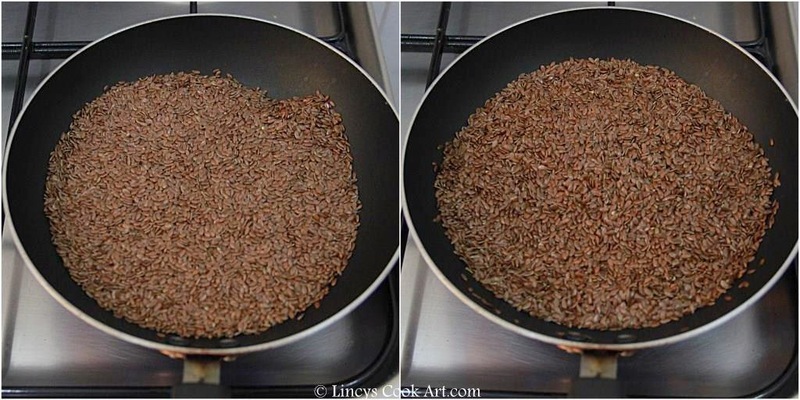 Heat a pan and add the flax seeds and dry roast them for few minutes till some of the grains starts to pop and the seeds gets a oily glaze. Do not over cook and as they might loose the nutrients at this stage. Remove from the pan and allow to cool. 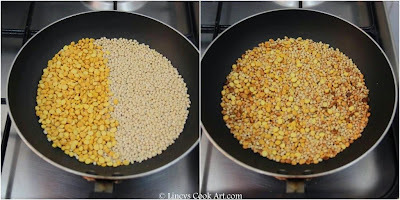 In the same pan add the channa dal and urad dhal and roast till golden colour. Remove from pan and allow to cool. 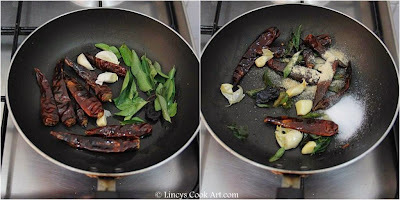 In the same pan add half a teaspoon of oil and roast dry red chillies, garlic cloves, curry leaves and tamarind together till the red chillies while curry leaves becomes crisp. Now add the asafetida and salt stir well in heat; Switch off the gas. Transfer with the other ingredients and allow to cool. Once all the ingredients reaches room temperature powder it in a blender jar. 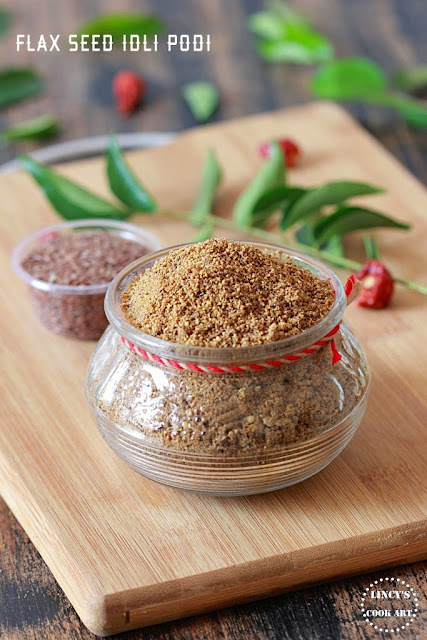 Take a tablespoon of flaxseed podi and mix with sesame oil and serve with idli or dosa. Note: Use within a month as it gets rancid soon. Or refrigerate for longer use. Healthy idli podi.. Nice way to include flax seeds in our diet..